Teams today are often dispersed across geography, time and distance. 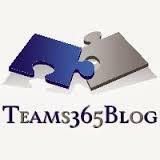 This Teams365 module explores virtual team leadership foundations. This Teams365 module explores the core elements of virtual team leadership. As business becomes more global, chances are your team is dispersed across geography, time and culture. Many team leaders have not been exposed to what makes virtual team leadership work. This four-part program looks at equipping team leaders with foundational skills in leading your team virtually. The program consists of four one hour calls held on a bridgeline, led by author and Teams365 master facilitator Jennifer Britton. A former virtual team leader herself, Jenn is also the author of Effective Virtual Conversations (2017) which includes several chapters specific to virtual teams and virtual team leadership. 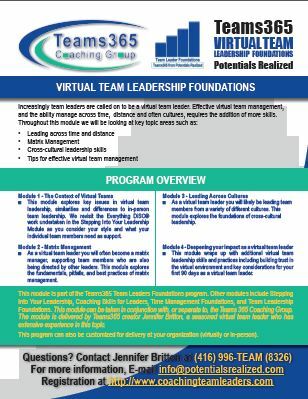 This is one of eight online learning courses around the foundations of Team Leadership including Coaching Skills for Leaders, Stepping into YOUR Leadership, Facilitation Skills Foundations, and Emotional Intelligence. This module explores key issues in virtual team leadership, similarities and differences to in-person team leadership. We revisit the Everything DisC work undertaken in the Stepping Into Your Leadership Modules as you consider your style and what your individual team members need as support. As a virtual team leader you will often become a matrix manager, supporting team members who are also being directed by other leaders. This module explores the fundamentals, pitfalls, and best practices of matrix management. As a virtual team leader you will likely be leading team members from a variety of different cultures. This module explores the foundations of cross-cultural leadership. This module wraps up with additional virtual team leadership skills and practices including building trust in the virtual environment and key considerations for your first 90 days as a virtual team leader. This module is part of the Teams365 Team Leaders Foundations program. Other modules include Stepping Into Your Leadership, Coaching Skills for Leaders, Time Management Foundations, and Team Leadership Foundations. This module can be taken in conjunction with, or separate to, the Teams 365 Coaching Group. The module is delivered by Teams365 creator Jennifer Britton, a seasoned virtual team leader who has extensive experience in this topic. For more than a decade, she led virtual teams in the international sector, and continues to work with clients on global leadership and cross-cultural issues. This program can also be customized for delivery at your organization (virtually or in-person).